As time passes, the serious contradictions in the agrarian question, contained in the current Political Constitution of the State, the INRA Law dictated by the government of Gonzalo Sánchez de Lozada and the Law of Community Reconciliation of the Agrarian Reform approved by the government of Evo Morales, legal provisions that, in their more general lines, are determining the sustained impoverishment of the indigenous masses and a state of permanent conflict between peasants and indigenous communities throughout the Andean territory and inter-Andean country. 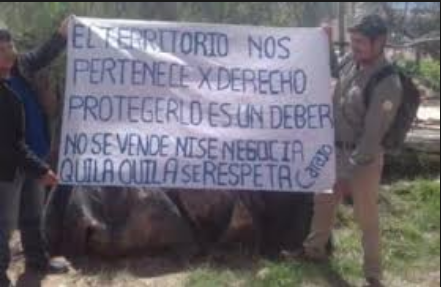 The most acute and recent case is related to the “marka” Quila Quila affiliated with the “nation” Qhara Qhara, which has raised a problem of land ownership before the INRA authorities and, given the impossibility of finding a solution, has a march, for about 800 kilometers, of the qhara-qhareños members towards La Paz to request an appropriate solution to their situation. This conflict reveals that it is only one of hundreds of similar cases that exist throughout the country, due to the obsolete and undemocratic agrarian legislation in force, which, in reality, is the tip of the line of a huge and tangled ball of problems facing the country’s rural environment and that will soon explode with remarkable scope. This entry was posted in Bolivia, Politics, Santa Cruz, Social Unrest and tagged Chuquisaca, corruption in public office, demagogue, democracy in peril, government failures, indigenous rights. Bookmark the permalink.